Delivering top quality products at an affordable rate every day. Elite Catering of Northwest Arkansas is owned and operated by Shane Bivin and Callie Flynt, both graduates of the University of Arkansas - Fayetteville. Together, Shane and Callie have over 30 years of experience in food service, catering, and event planning. Elite Catering is located in Fayetteville, but provides service to all of Northwest Arkansas and the surrounding areas. They saw the need for a fresh, new catering company that could provide quality food and exceptional service to the ever changing and growing NWA area. Then, they immediately set out to accomplish just that. 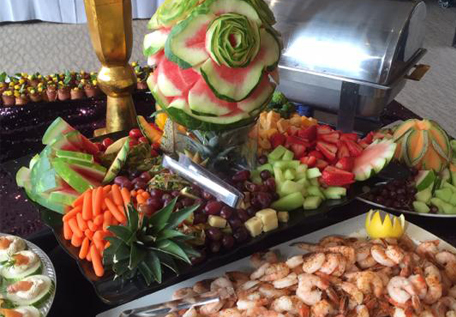 Elite Catering offers a wide variety of full service catering options for any type of event (weddings, corporate events, office gatherings, tailgates, school functions, and more). Every menu is customized for each client based on their vision and budget. Check out a few of our menu options to get some inspiration for their next event. Let us make your next event EXTRAORDINARY! There is nothing we can't do!